"The national Russians, in the heart of their country, are nowhere contiguous to the sea; but wherever they are found on the coast they appear as strangers and dispersed colonists." The Russian navy’s modernisation and re-equipment programme is grounded in a sophisticated national maritime strategy, posing a series of challenges for the west. Not least for the UK; which had been, until recently, operating under the assumption that post-Cold War Russia was a spent power. Russian involvement in the crises in Syria and the Ukraine has led to an increasingly confrontational relationship with the West of late, which has spurred a reappraisal of Russian capabilities and the challenge posed by their armed forces. At sea these challenges arise from a more active submarine arm, which the West is not well prepared to confront, coupled with a revitalised green-water flotilla and increasingly professional amphibious forces. Onto this is somewhat messily tacked a troubled, but nonetheless capable, blue water surface fleet. Russia’s submarine programme remains the most significant area of their naval modernisation, with investment in a large fleet of conventional (SSK/SSI) and nuclear-powered (SSN/SSGN) attack submarines. 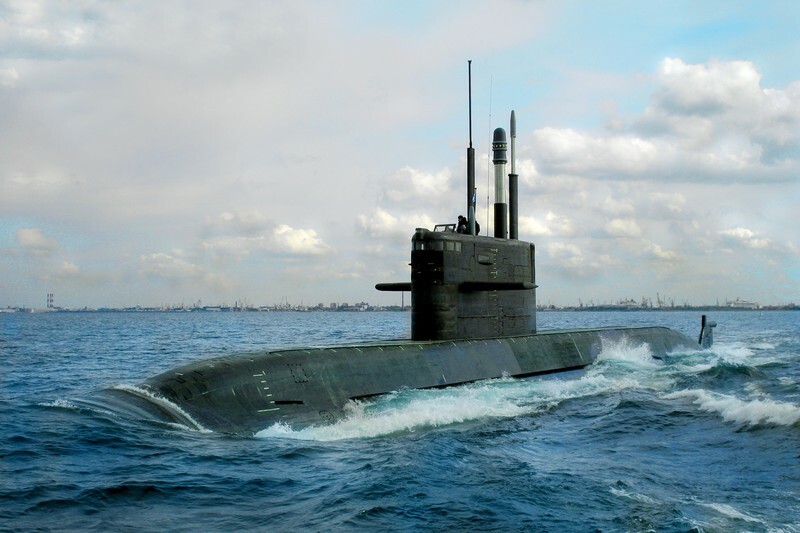 Part of its nuclear deterrent is also carried aboard a fleet of 13 nuclear-powered ballistic missile submarines (SSBN). 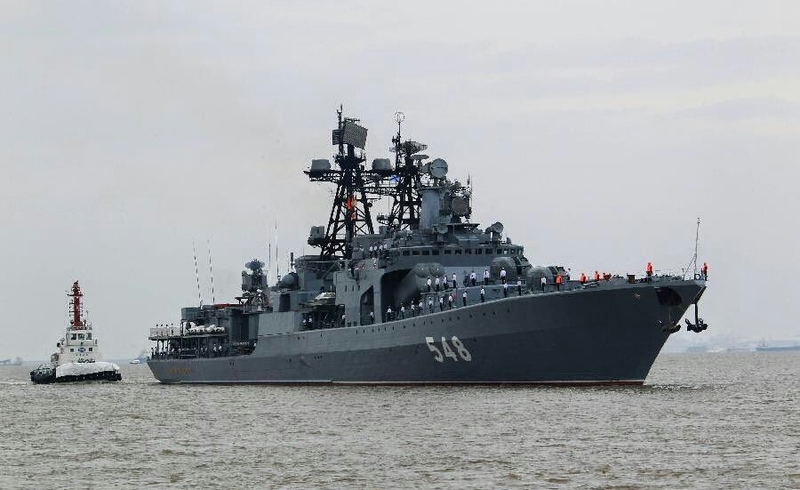 Their ambitious modernisation programme involves overhauling twelve Soviet-built SSNs, SSGNs and SSBNs of the Project 971 Shchuka, Project 949A Antey and Project 667 Kal’mar classes. Upgrades will focus on replacing the boats’ armament and vital systems to extend their service lives by 15-20 years. While this appears impressive, and in many respects it is, the underlying factor driving them is the failure of the Project 885 Yasen SSGN programme to deliver affordable and timely replacements for the Shchuka and Antey classes. The impetus for modernising the Kal’mar class also appears to be similar: technical troubles with its replacement, the Project 955 Borey SSBN, and its weapon system: the RSM-56 Bulava submarine-launched ballistic missile (SLBM). Russia’s nuclear submarine industry also remains impressive; with the latest Project 955 Borey SSBN taking 8 years from laying down to commissioning , in-line with Western equivalents. Despite the apparent strength of their nuclear submarine industry, the Project 677 Lada conventional submarines ran into technical troubles after the first boat failed to live up to expectations. Her problems seem to have been focussed around the boat’s new air independent propulsion (AIP) system. The project was halted in 2011 and the two other boats under construction had to undergo a major redesign. Two further boats have now been ordered, bringing the total to five. The Lada is reportedly significantly quieter than the existing Project 636.3 Varshavyanka diesel-electric boats, already known for their low radiated noise levels and difficulty of detection. The delay did, however, precipitate orders for two batches of six improved Project 636.3s for the Pacific and Black Sea fleets as an interim solution, many which have already been delivered. The end result of their SSK, SSN, SSGN and SSBN modernisation programmes is a precipitate increase in the activity of the Russian submarine fleet. Although they are regenerating from a low base, the return to a much higher operational tempo has caused some concern in the West. The reappearance of the Russian nuclear submarine force in the North Atlantic and Mediterranean is a particular challenge to assumptions made by the UK as recently as 2010. The UK’s shrinking SSN force (currently fluctuating between six and seven boats as the Trafalgar class retire and new Astute class boats replace them), record-low number of ASW frigates, overburdened Merlin ASW helicopter force and gapped maritime patrol aircraft (MPA) all point to a badly hollowed-out anti-submarine warfare (ASW) force that will struggle to rise to Russia’s challenge in the near future. However, there may now be some recognition that the Russian challenge is real and requires a response; with the 2015 SDSR pledging to close the MPA gap and eventually increase the number of fleet escorts beyond 19. This is bolstered by an order for three additional Sonar 2087 towed arrays, for use on the Type 26 and potentially the Type 31e, increasing the Royal Navy’s total from 8 to 11. While the US Navy’s mass is certainly greater than the Royal Navy it also faces problems in ASW, with its SSN force due to shrink from 52 boats to 41 by 2029. This would be less concerning if their focus and resources weren’t being drawn towards the Pacific, due to tensions with China. The early retirement of all of its Spruance and most Oliver Hazard Perry class ASW ships has also caused problems, with the task now left to non-specialist Arleigh Burke class destroyers. While new equipment may be needed, possibly sooner than expected, the most pressing requirement is for the regeneration of critical ASW skills which have atrophied since the end of the Cold War. One area where Russia has made real strides is in small surface combatants. With 13 Project 21630 Buyan, Project 20380 Steregushchiy, Project 20385 Gremyashchiy, Project 20836 Derzky and Project 22800 Karakurt corvettes launched since 2006 and a further 17 in various stages of construction. These ships, ranging from 500-2000 tons, are equipped with surface to air missiles; close in weapons systems (CIWS) and strike-length cells for a small number of cruise or anti-ship missiles. Making them highly capable for their size, although their ability to remain at sea for prolonged periods remains limited. These new ships augment a large number of Soviet-built corvettes and missile boats of the Project 1131M Parchim, Project 1124 Grisha, Project 1234 Ovod and Project 1241 classes. While Western navies may seem better prepared to deal with the threat of small surface combatants, the Royal Navy in particular has extensive experience of combatting them in the Falklands and first Gulf wars, in reality these new Russian ships pose significant challenges. This is partly because they appear to have been designed with the lessons of these conflicts in mind. Russia’s design response makes a repeat of the 1991 battle of Bubiyan, where Iraqi missile boats were destroyed easily by helicopters and aircraft, unlikely. In comparison with these vessels the US Navy’s smaller surface combatant, the Littoral Combat Ship (LCS), seems distinctly underwhelming, with its only clear-cut advantage being its speed. 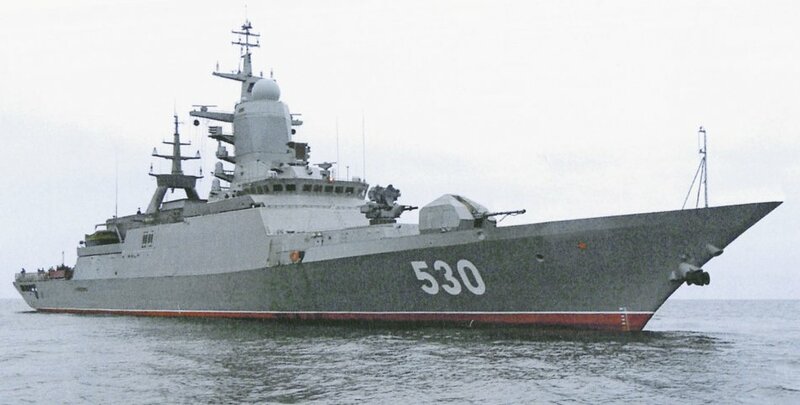 It is outclassed by its Russian counterparts in many fields, including short-range air defence systems in the case of the larger Steregushchiy and Gremyashchiy classes, and in terms of cruise and anti-ship missiles by all of Russia’s modern corvettes. These ships alone pose new challenges to the western model of using missiles delivered by rotary wing aircraft against smaller surface combatants. However, when operated alongside larger surface combatants, equipped with capable air defence missile systems such as Redut, the effectiveness of present Western doctrine and equipment is thrown into question. This is particularly concerning as smaller Russian ships have proved successful on the export market. Algeria have already acquired two Project 20382 Tigr corvettes and Brazil have also expressed interest. While a direct conflict between Russia and the West remains unlikely, proliferation of these smaller ships to third party navies greatly increases the chances of Western navies coming into contact with them in the future. Russia’s amphibious forces have undergone a decade of troubled development. Steady funding was, until recently, being provided for new amphibious ships. These included two Project 11711 Ivan Gren tank landing ships and, until 2014, four French-designed Mistral class multirole amphibious assault ships. To be delivered by DCNS and the Russian United Shipbuilding Corporation. However, the collapse of this programme shortly after Russia’s invasion of Crimea resulted in none of them being delivered. While several designs for Mistral-like amphibious ships have been proposed since, a firm order has yet to materialise. It now seems unlikely that the Russian navy will realise their ambition to have the first of these ships ready for 2020. As with many Russian naval construction programmes, the Mistral surrogate seems to be creeping to the right, with the Russian defence ministry suggesting that the first could now enter service in 2022. Unless a significant number of these new amphibious assault ships are ordered, the Russian navy will find itself forced to operate aging Project 1171 Tapir and Project 775 Ropucha LSTs well into the 21st century. At present the funded component is inadequate to replace their existing capabilities. While Russia’s amphibious forces are limited in their ability to project power out of area, something which a future helicopter carrier could change, their ability to threaten states in Russia’s near abroad, notably in the Black Sea, Baltic and High North is considerable. The professionalisation of their naval infantry has also continued apace, with almost all their conscripts now replaced by regular troops. Regular amphibious exercises, on a smaller-scale to their Soviet predecessors, have again become a routine feature of Russian military activity. 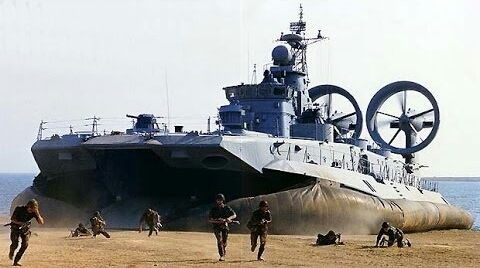 There are also indications that Russia may restart the production of the formidable 400 ton Project 1232.2 Zubr assault hovercraft. These developments point to a focus on their traditional role: short-range operations in support of ground forces, rather than overseas expeditionary employment. This is problematic for the West, as Russia’s ability to threaten its neighbours, including NATO members, with amphibious force remains a significant concern. Considering these forces are tailored for operations in close proximity to the Russian mainland, where they can be more effectively supported by land and air forces. There is some, more limited, potential that these forces may be used beyond Russia’s immediate region in the future, potentially in the Eastern Mediterranean, using the Tartus naval base. A battalion of Russian naval infantry, deployed to Syria in 2015, indicates Russia’s ability project a modest amphibious force beyond its near abroad. Russia’s short-range amphibious potential is clearly of concern for many of the weaker states which encircle the Black Sea and Baltic. The presence of these forces allows Russia to hold those regions at risk, signal political intent and implicitly threaten the security of a number of allied states. Coupled with an increasingly modern and capable green water corvette navy these forces continue to pose a significant challenge, mostly below the level of conflict. The final aspect of the Russian Navy’s re-equipment programme concerns their blue water ‘great power’ navy. This force is formed around three capital ship classes; the Project 1143.5 Orel heavy aviation cruiser: Admiral Kuznetsov, Project 1144 Orlan nuclear powered cruiser: Pyotr Velikiy and the three Project 1164 Atlant cruisers: Moskva, Marshal Ustinov and Varyag. In addition the Admiral Nakhimov, a Project 1144 Orlan cruiser built by the Soviet Union, is presently undergoing a major modernisation aiming to bring her back into service by 2018. 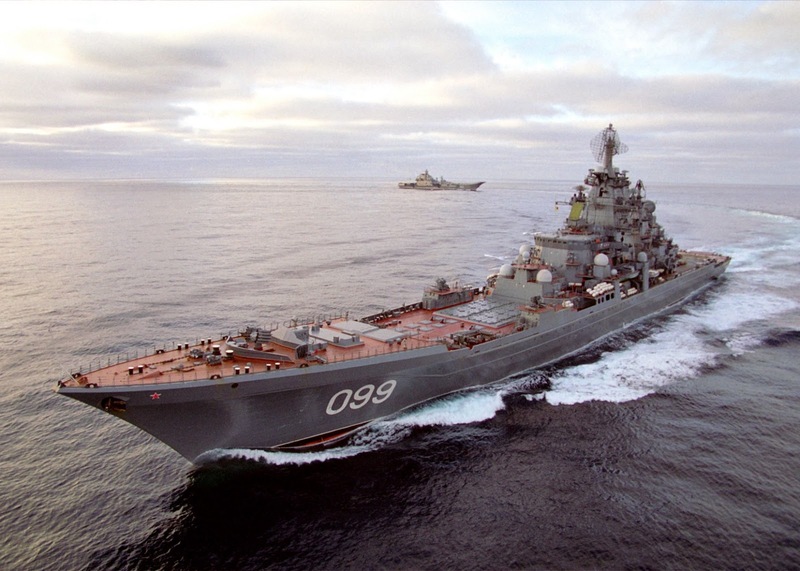 After which the Pyotr Velikiy will undergo a refit to bring her up to the same standard. Both ships will eventually carry the S-400 air defence missile system and 3M-54 Kalibr anti-ship missiles. In future, hypersonic 3M-22 Tsirkon anti-ship missiles may also be added. The three operational Project 1164 Atlant cruisers also recently underwent refits replacing their anti-ship missiles and radars with more capable models. Admiral Kuznetsov is expected to begin an extensive two and a half year refit in 2017; aimed at rectifying the shortcomings in her deck equipment and propulsion system exposed by recent operations. The refit, planned to be complete by 2020, will allow the Admiral Kuznetsov to operate for up to 25 more years. The Russian Navy seems quite capable of keeping legacy Soviet capital ships in service through a series of extensive, if erratically managed , modernisation programmes. However, serious question marks remain over their eventual replacements. The more ambitious of these are the Project 23000E Shtorm nuclear powered supercarrier and twelve Project 23560 Lider/Skhval nuclear powered ‘destroyers’, designed to displace over 17,000 tonnes. 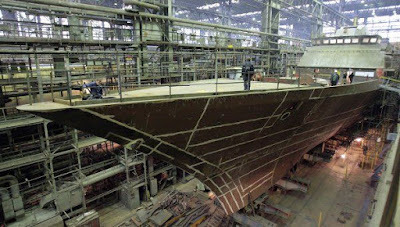 It is unlikely that Russia’s shipbuilding industry has the ability to build the former, especially considering their poor performance during the refit of the Soviet-built Project 1143 Krechyet carrier Admiral Gorshkov, now INS Vikramaditya, for the Indian Navy. Similar doubts hang over the Project 23560 Lider/Skhval. Commentators seem to agree that Russia’s ambitions are unrealistic, placing the maximum possible at three or four, due to economic and industrial constraints. Presently these programmes appear to be in limbo, both may be “indefinitely postponed” in the 2018-2025 state arms programme in favour of investments in land and air forces . This leaves the Russian navy operating fourteen Soviet-built Destroyers of the Project 956 Sarych and Project 1155 Fregat types, ranging from to 24 to 32 years old. Without firm plans for replacements, in practice it may fall to Russia’s new generation of frigates to provide task group escorts in the future. More modest ships, of the Project 22350 Admiral Gorshkov and Project 11356P/M Admiral Grigorovich classes, will fill the roles of older Soviet destroyers. Although Admiral Gorshkov is now in service the production of Project 22350 frigates has been chronically slow and has revealed serious problems within Russia’s surface shipbuilding industry. The programme was also disrupted by Ukraine’s refusal to supply Russia with gas turbines after the annexation of Crimea. The Russian navy’s response was the Project 11356P/M frigate, the Admiral Grigorovich class. A less ambitious design based on the Soviet-era Project 1135 Burevestnik frigates, with two in service and a further four under construction for the Black Sea Fleet. This programme has also been hit by the Ukrainian embargo, with the last three ships lacking main engines. Although the timely production of new surface combatants has been blighted by technical and industrial shortcomings the capabilities of these new ships are, in most cases, improvements upon their predecessors. Although not as impressive as their Soviet-era predecessors in their day, the latest Russian frigates are well armed by European standards, carrying respectable numbers of anti-aircraft, anti-ship and cruise missiles. The Russian surface fleet modernisation programme poses a series of complex problems for the Western alliance. It gives Russia the ability to project hard and soft power overseas, with occasional out of area deployment of a cruiser or carrier-led battlegroup. While the utility of these assets, especially the carrier, in a ‘hot’ war with NATO is more limited, their ability to be used assertively to frustrate, block and complicate the situation for the West in a limited war scenario, such as in Syria, is notable. A capability they have demonstrated in the Eastern Mediterranean. While naval diplomacy has been in vogue for the Russian state in recent years, their ability to maintain a forward-leaning posture beyond the Syrian conflict depends upon their willingness and ability to replace the remnants of the Soviet Union’s blue water navy. Technical and tactical challenges also arise from Russia’s surface fleet modernisation. At present the open ocean anti-surface warfare capabilities of most western surface combatants are distinctly limited, in many cases relying upon updated versions of heavyweight anti-ship missile systems, such as Harpoon and Exocet, developed in the late stages of the Cold War. When compared with modern Russian-made missiles these tend to be slow, shorter ranged and carry a lighter warhead. The Royal Navy’s predicament is likely worse than most, set to retire the venerable Harpoon Block 1C in 2018 with no official replacement due for a decade. While there has been investment in light helicopter launched missiles, such as Sea Venom, their limited range, helicopter launch platform and small warhead make them unsuitable for attacking large surface combatants in open waters. The West’s answer to the threat posed by long-range Soviet anti-ship missiles was, during the Cold War, to extend their missiles’ range by launching them from aircraft . 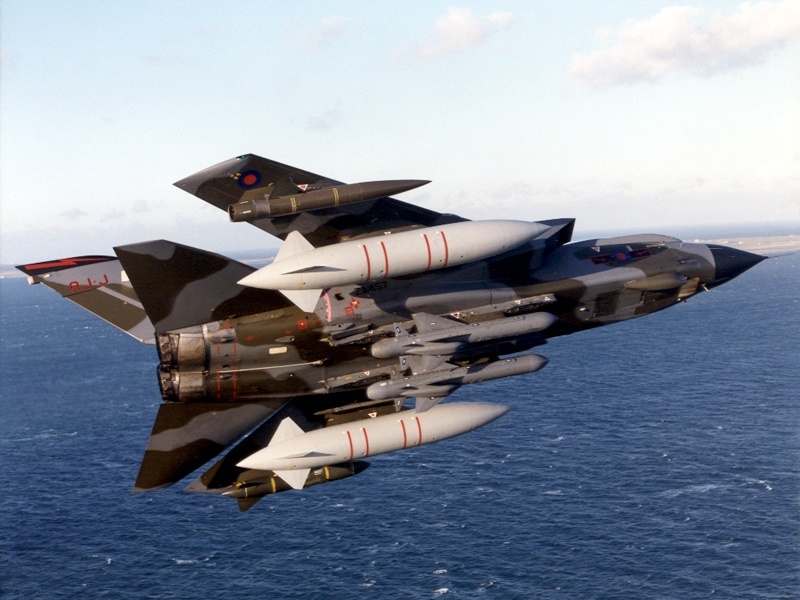 However, since the 1990s the stocks of these missiles have either been greatly reduced or, in the case of the British Sea Eagle, removed from service altogether. The US Navy is belatedly running a competition to modernise its anti-surface warfare capabilities. Lockheed Martin, Boeing and Kongsberg have all entered new anti-ship missile systems: the Long Range Anti-Ship Missile (LRASM), modernised Harpoon Block II+ER and the Naval Strike Missile to equip the Littoral Combat Ship and a new generation of frigates. At a time when other navies, both allied and potential opponents, are investing in a new generation of surface and air-launched anti-ship missile systems the British government’s decision to risk gapping them for the foreseeable future can be described as questionable at best. Failure to take the Russian naval threat seriously in the decades after the Cold War has left the UK and its major NATO allies ill-prepared to tackle the challenges posed by its resurgence, though it remains a poor shadow of its Soviet predecessor. Neglect of anti-surface and anti-submarine capabilities has left both the British and American navies, as well as their allies, in need of additional resources to regenerate or seriously modernise; at a time when fiscal pressures remain intense. 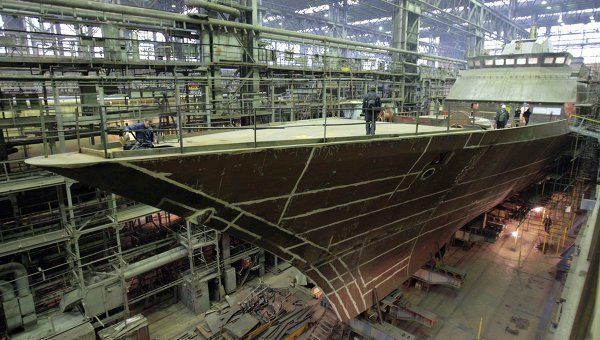 At least the poor state of Russia’s shipbuilding industry, especially for large and complex surface ships, will likely limit or stymie their more ambitious programmes. Budgetary pressures from the other Russian armed forces coupled with Russia’s economic troubles may also curtail the scope and pace of their naval modernisation. Russia’s green water navy also constitutes a network of formidable littoral threats. Russia’s renewed ability to leverage these capabilities to project power in its near-abroad is also a distinct development, noticeable in Syria and the Baltic, which warrants a response. This is especially pertinent as these naval technologies have been widely exported by Russia to third-parties. Combatting these threats should be an increasingly pressing concern for Western navies, many of which are still relying on solutions grounded in thirty year old practice. Finally, the quintessential Cold War naval threat: Russian nuclear powered attack submarines, are back on the scene in the Atlantic and further afield. This raises questions about the credibility of threat assessments which, until recently, ignored or downplayed Russia’s capability in this field. It goes almost without saying that the West’s wider neglect of ASW forces and training, following the end of the Cold War, appears to have been a mistake. The UK and its allies are running serious risks by not remedying these shortfalls in a timely manner. Your review comes up on the best Google seeks from such a significant number of watchwords. You would be amazed to realize that for most young men, and that incorporates some great looking ones, asking a young lady out on the town is a standout amongst the most frightening of assignments. Step by step instructions to ask a young lady out is something that is simple as will be clear subsequent to perusing this blog.